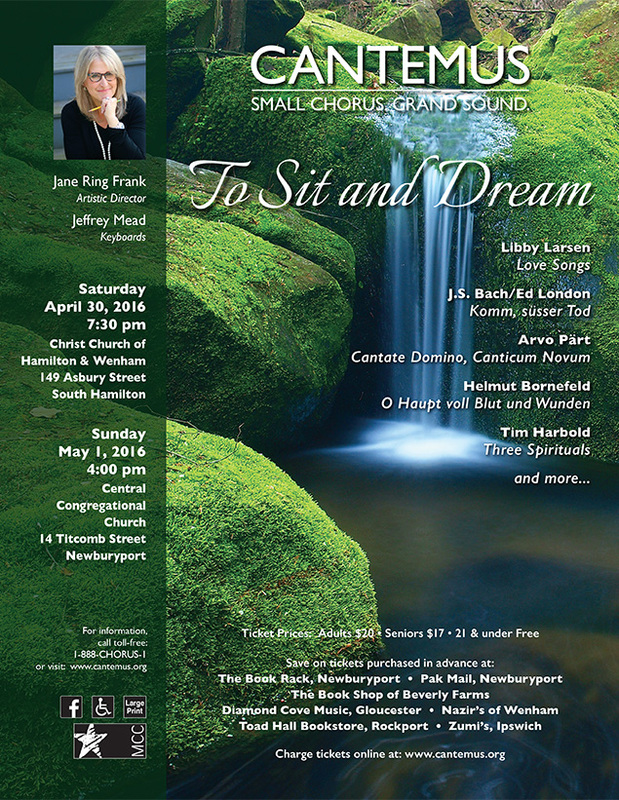 (March 22, 2016) —“Musings, reveries, daydreams, imaginings and re-imaginings” is how Cantemus Artistic Director Jane Ring Frank describes the program she has created for the chamber chorus’s spring concerts on April 30 and May 1. “This collection of music and texts slyly looks to the past for inspiration, while boldly moving into the future. It ranges from re-interpretations of two of Bach’s most famous chorales to heartfelt love songs to four rousing American spirituals,” she said. 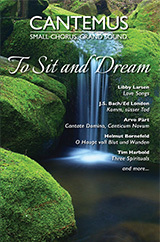 “Cantate Domino canticum novum” by contemporary Estonian composer Arvo Pärt plus modern re-imaginings of two well-known Bach chorale melodies, by Helmut Bornefeld and Ed London, round out Cantemus’s spring program. The concerts take place Saturday, April 30, at 7:30 PM at Christ Church of Hamilton-Wenham, 149 Asbury Street; and Sunday, May 1 at 4 PM at Central Congregational Church, 14 Titcomb Street, Newburyport. Audience members should note that Cantemus has a new ticket policy this season: Due to increasing audience sizes, the chorus will now sell tickets for EITHER Saturday OR Sunday; in the past, a ticket was good on either day. Tickets are available at retail outlets around the North shore, online, and at the door.